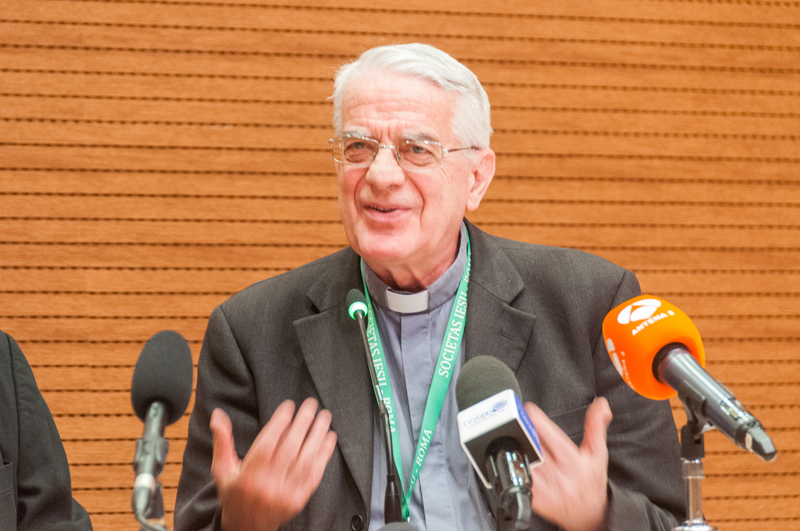 As one of the Assistants ad providentiam, Father Federico Lombardi is the one who thanked Fr. Adolfo Nicolás, in the Congregation and in the name of the whole Society of Jesus, for having directed the Society in the course of the last eight years. Our bulletin reported last Tuesday on this important moment of the Congregation. But Fr. Lombardi is a well-known man who is recognized not only by his Jesuit confreres but also in the world of the international religious media. For 25 years, this Jesuit has been a major presence at the helm of Vatican Radio, and for about ten years, he was also the spokesman for the Vatican, the director of its press office. On 31 July he left these responsibilities. However, his former employer, the Vatican, took no time to propose another job to him. He has been named President of the Joseph Ratzinger—Benedetto XVI Foundation. This work is dedicated to the support of theological research in three main ways: offering scholarships for doctoral students doing cutting-edge work in theology, awarding annual prizes for the whole oeuvre of certain contemporary theologians, and organizing an annual symposium. The financial resources of the Foundation come from royalties from the sale of Ratzinger’s works written both before and after his election to the papacy. Why did Father Lombardi choose to preside over this foundation? He knew Cardinal Ratzinger from very close range. On a daily basis he worked with him for seven years after this cardinal became Pope Benedict XVI. He appreciated his work in the theological domain, and he is happy to be able to support the continuation of the former pope’s commitment. Besides, this Italian Jesuit recognizes that the presidency of the Ratzinger Foundation is not a full-time activity. After the General Congregation, once he will doubtless no longer have the responsibilities that he had as assistant to Father General, he will make himself available to the Jesuit Provincial of Italy for any role that the Society would like to entrust him with.